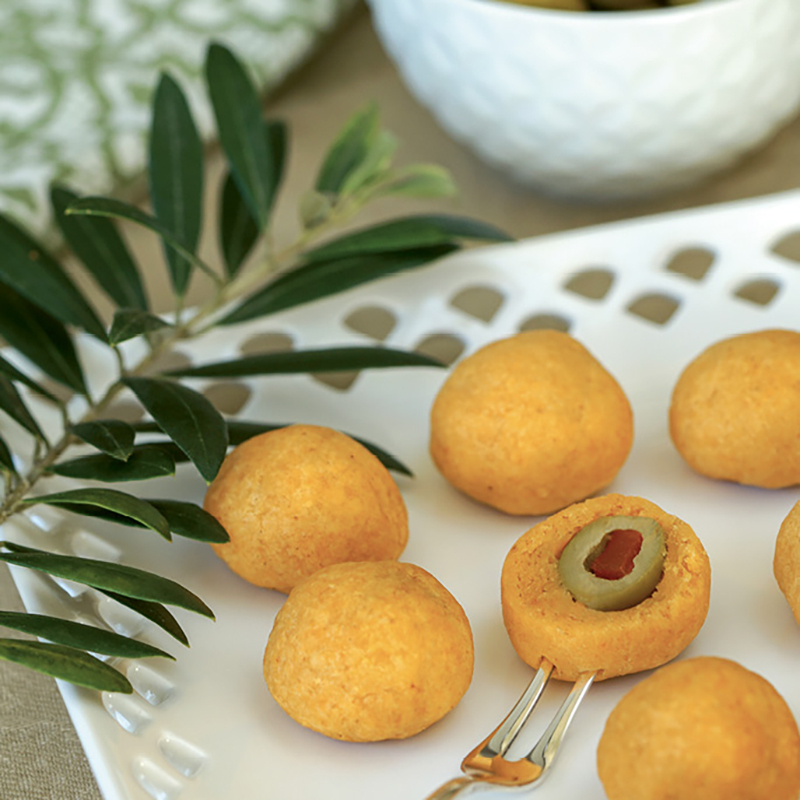 Southern Olive Bites feature green olives baked inside cheesy dough; Inset: Brent & Lizzie Hamilton. Brent and Lizzie Hamilton’s partnership, in life and business, started with a kindred love for S.O.B.s.—short for Southern Olive Bites, a cheeky take on a Southern appetizer. Two decades ago, when Brent and Lizzie first met, they called the savory, one-bite snacks “olive balls.” Homemade by Brent’s mom, Idelle, they were kept generously stocked in Brent’s freezer throughout the couple’s early courtship. When Brent and Lizzie married, the olive ball supply continued, and soon their quick-bake munchie stash transformed into the ideal finger food for the South of Broad fêtes they famously hosted. Idelle’s olive balls eventually became synonymous with Hamilton gatherings, which, as Lizzie likes to say, are all about “fun friends and full glasses”—a spirit they now hope to share widely through their packaged hors d’oeuvres company, Southern Olive Bites. The bite itself belongs to a larger heritage of Southern entertaining, as a quintessential bridge night snack or cocktail party canapé, dating back to the 1950s. These freezer-to-oven morsels (known by some as “hot cheddar balls” or “hot cheese olives”) contain a pimiento-stuffed green olive nested within a pillow of cheesy dough. No matter the recipe—of which there are many—the prep process is enduringly labor-intensive and messy. The Hamiltons’ version (calibrated in flavor, elegantly shaped, and incredibly addictive) looks to provide a shortcut for nostalgic Southern entertaining, with a bit of ease. Order S.O.B.s for $14.95 per bag of 36 at southernolivebites.com. Making the leap from home-cook hosts to artisanal food entrepreneurs, though, has been anything but easy. As a physician and pharmacist respectively, Brent and Lizzie juggled their day jobs while raising their toddler son, all while jumping through the myriad regulatory hoops necessary for adapting their beloved bites for the broader culinary market. Encouragement from friends and family helped fuel their endeavor, and in 2017, Southern Olive Bites launched to warm fanfare, just in time for the holiday party season.